At the opening of Ron Reed’s play – indeed, his labour of love - audiences were informed with the bad news that John Innes, the actor playing the title role, had needed medical attention, and although seemed to be recovering, it was determined that for the good of his health he would not be expected to continue in the role. The good news was that playwright and director Ron Reed was able – though, not likely willing – to step into the role. The play itself is a three act historical drama, which offers the audience the extrinsic sense of being a fly on the wall at the Eagle and Child pub and other places that the Inklings would gather. The Inklings (as in: “don’t have an inkling”) was a literary group of academics and soon to be legendary writers. 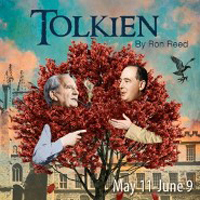 While it's J. R. R. “Ronny” Tolkien who is the titular character (no doubt due in part to Reed’s fascination with the writer), the play is very much an ensemble piece. It largely focuses on the complicated friendship between Tolkien and C.S. “Jack” Lewis (Ian Farthing) and their extended association with other members of The Inklings: C. S. Lewis's brother Warren Lewis (Tim Dixon), South African poet and satirist Roy Campbell (Simon Webb), British poet and novelist Charles Williams (Anthony F. Ingrams), and academic and committed Christian Hugo Dyson (also Simon Webb). The story naturally begins when Tolkien and Lewis meet at Oxford a few years before the outbreak of WWII and generally meanders through roughly two-and-a-half hours of dense dialogue that concludes at Lewis’ funeral in 1963 (Lewis died on November 22, 1963, but the news was of overshadowed by the death of President Kennedy on the same day). Reed shows Tolkien, in his story-telling rather than in his acting, to be an enigmatic figure. He and Lewis could hardly be more disparate in their temperament. Despite being a man of deep faith, Tolkien was cantankerous and solitary, while Lewis was friendly and idealistic. I’m sure that Ron Reed would have much preferred not to have had to take the lead role. To be fair though, it was understandable that he perform with the script in hand, barely a couple of days in which to prepare. Reading from the script was a hindrance to his normally natural movement around the stage. However it was the better choice over cancelling the show. Of the other players, Ian Farthing and Anthony F. Ingram particularly stood out. Ingram was brilliant as novelist and playwright Charles Williams, who is portrayed as the most eccentric of the group. The actor certainly managed to grasp a London middle-class accent. Farthing, on stage for almost the entire show, skillfully displayed the optimism that Lewis is renowned for. Erla Faye Forsyth, the only female cast member acquitted herself well in the small, though integral role of Tolkien’s patient wife. Drew Facey’s imaginative set that essentially only consists of a large floor to ceiling tree constructed to allow adequate opportunity to sit below its branches. Set in the wooden stage floor is a symbolic compass design with the cardinal directions accurately indicated. Tolkien gives audiences the chance to experience the beginning and creative process in the author’s fantasy works The Hobbit, and The Lord of the Rings. Nonetheless, I see Reed’s play as still a work in progress. I would anticipate that any future mounting would be significantly condensed.